Okay, so I’m doing something this weekend, and I can’t really tell my loyal PopCult readers about it. Well, I can tell you about it, but I can’t tell you what it is. It’s not that it’s a big state secret or anything. It’s just that…well…I have an agreement with the Charleston Gazette. They let me write about anything I want as long as it can be at least somehow tied to pop culture. Toys, comic books, movies, television, music, concerts, bowling, telemarketers–it’s all fair game. There are just a few very reasonable rules for me to follow. I can’t slander or libel anyone. I can’t post outright lies. I can’t plagarize. And there are two words that I have agreed to never use in this blog. You can probably guess which two words those are. If you’ve ever dropped a heavy hammer on your bare foot, these would be the two words–the ones with just the perfect mix of hard and soft consonants to satisfy your need to exclaim–that come out of your mouth. I’m fine with not using those words. It makes my blog family-friendly (or some ersatz version of such) and it makes me a better writer. However, this weekend Melanie and I will venture down to Princeton to be guests on a very cool and funny webshow, which will have to remain nameless. I can’t even embed the video here because one of those oh-so-satisfying-to-say but oh-so-unfit-for-mixed-company words is in the title. So I can’t mention it, or embed it, but I can link to it. If you are not offended by dirty words–and this show includes the grand-daddy of all dirty words in the title–you can find it HERE. I highly recommend it for the less-easily offended of you because the previous shows, with guests like The Renfields and The Wayward Girls School of Burlesque, have been hilarious. The premise of what we will refer to here as the “Wake the HECK Up Show” is that it is a drunken and combative morning talk show. Mel and I will be on the show to tell uncensored stories about the production of Radio Free Charleston and any other topic that comes up. 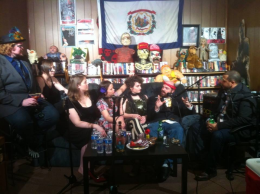 The main interviewer is Stephen Hensley, the Outlaw Rockstar, who has interviewed me in the past. He’s joined by his co-host, Craig Walker and the show is filmed and edited by Scott Gregg and Zachary Whetzel. We expect to have a blast doing this. This will be my first trip to Princeton, and I think it’ll be the first long interview I’ve given about RFC since my Sandy Wells “Innerview” over four years ago. After the guys have time to edit and post the show, I’ll let you all know about it here in PopCult. I just won’t be doing it by name. I think we might be able to get away with calling it WTFU.